Welcome to our Summer edition of the MCC Newsletter. MCC is a volunteer organization focused on operating events that foster pride and promote an active, welcoming community. To keep you informed and involved, we offer two brief news items about our recent activities. Enjoy. Thanks to nearly one hundred volunteers, great weather, and nearly 1700 visitors, the 7th annual Mundelein Beer Festival was a big success. Thanks to our sponsors: Tighthead Brewery, Mundelein Community Bank, Center for Wellness Chiropractic Care, Medline Foundation, MacLean-Fogg, PNC Bank, Sysmex and The Village of Mundelein. The Beer Festival is MCC’s signature event and its largest fundraiser. To capitalize on its popularity and success the Board hired Ben Hollis to produce a promotional video that captures the spirit and fun of the festival. Volunteers are always needed and are very welcome as well as your feedback. The MCC Board held two special meetings in April and May 2018 to discuss strategic planning and examine its Mission. The sessions were facilitated by Village Administrator John Lobaito. Assistant Village Administrator, Peter Vadopalas, also participated. During the meetings the Board members reviewed MCC’s Strengths, Weaknesses, Opportunities, and Threats; and discussed the value of its programs and events for residents, businesses, and visitors. The Board’s objective is to expand on past successes, keep events family-focused, fun and relevant. The next planning session is scheduled for July 30th. The planning process will also include a review of the by-laws and development of a succession plan for keeping the organization viable for the years to come. 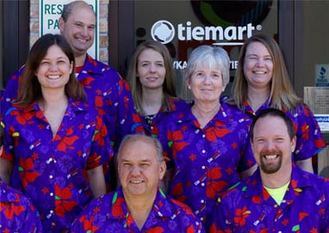 Tiemart®, Inc. is a family-owned-and-operated business, located at 525 Morris Ave. dedicated to providing high quality neckties, bow ties, pocket squares and other fashion accessories at affordable prices. Tiemart products are sold on-line directly from 5 branded websites, as well as through Amazon and E-Bay. All orders are processed from the Mundelein facility. 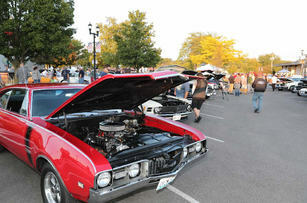 Park on Park Cruise Nights present the best collection of pre-1977 classic cars in Northern Illinois. Now in its 18th year, Park on Park is a Rain or Shine event on the 2nd Wednesday of the month, May thru September. Of course, if it rains there are not many cars. The remaining events are July 11, August 8, and September 12 at the intersection of Seymour and Park Streets in Downtown Mundelein. Our June show attracted over 550 cars and more than 1000 spectators. Food vendors are Brother’s Ribs, Luke’s of Mundelein and Tony Cannoli Deserts, plus dining and beverages at a number of downtown restaurants. Music by DJ Randy Oliver, sponsored by Mike at Matco Tools and Mundelein Automotive. For a complete list of our 47 sponsoring businesses from throughout Northern Illinois visit www.parkonpark.com. For additional information contact Tony Christie 847-710-4629 or email parkonpark@hotmail.com. Mundelein Fine Arts Festival, a two-day event will be held from 10 am to 5 pm on Saturday, September 8 and Sunday, September 9, 2018 in Kracklauer Park in downtown Mundelein. The festival features great artists and skilled craftsmen, as well as work of select students from Mundelein and Carmel Catholic High Schools, entertainment by local musicians and food from Mundelein restaurants. The Festival is a partnership between MCC and the Mundelein and Recreation Park District. MRPD Marketing Manager, Christa Lawrence, who conceived the festival 9 years ago, explained that, “MCC and MPRD share marketing and organizational duties. Over the last couple of years District’s role expanded to include the provision of additional manpower for the event and volunteer staffing. The Park District also hosts the “Kiddie Art Tent”. “Businesses”, she added, “can support the festival in two important ways. First, by participating in the Purchase Award program, which is a commitment to buy art at the festival for display at your business”. Businesses that pledge to buy a piece of original art for at least $100, receive a lovely purchase award ribbon, publicity for your company at the event and on-line, and obtain an original work of art for your business. Visit www.mundeleincommunityconnection.org for more information on the event and for forms regarding the Purchase Award Program and business sponsorship opportunities. Anyone interested in volunteering at the festival should contact Christa Lawrence at clawrence@mundeleinparks.org. The 2018 Bike Rodeo sponsored by Ray’s Bike and Mower, 612 E. Hawley Street, and Mundelein Community Connection originally scheduled for June 10th was rained out. This fun event for kids and families has been rescheduled for Sunday, July 15th from 10 a.m. to 1:30 p.m., in the Fairhaven Plaza parking lot. Also participating will be the Mundelein Police and Fire Departments, Ace Hardware and the Mundelein Park District. Mundelein families with young children are invited to participate in this fun and educational event, focusing on bicycle safety, bike-related activities, safe bike riding, biking in our great park system and throughout the beautiful Lake County trail system. Participants can learn how to properly fit a helmet, receive basic bike inspections, take a fire truck ride, get tips on family-safe bike rides, ride along a bicycle obstacle course, obtain copies of the Lake County trail system map, and talk with knowledgeable riders about biking in our community. Each participant ages 3 to 13 will receive a free raffle ticket to win one of three bicycles from Ray’s Bike and Mower. As well, there will be a Bicycle Decorating Contest, and Bike Parade. Decorate your bicycle at home or at the event. Prizes will be given for 1st, 2nd, and 3rd place contest winners! Attendees will be treated to a FREE hot dog lunch, with chips and cookies (while supplies last). Lunch is served from 11 am to 12:30 pm. NEW THIS YEAR we have added a 3-mile family bike ride for kids 8 and over accompanied by a parent. The family ride will be led by 2 Police Officers from the Mundelein Bike Patrol. All bike ride participants must wear a helmet and attend a brief safety orientation before the ride. The ride will begin at 12:30 from the Ray’s Parking Lot. Bike ride participants will be treated to a FREE cup of Greg’s Custard! The Office Clubhouse, Mundelein's latest featured business, provides a collaborative office and event space to its customers offering budget friendly office space, co-working, conference, and special events facility. DENMAC Properties LLC, a development company in Lake County, officially opened The Office Clubhouse on April 1, 2018. 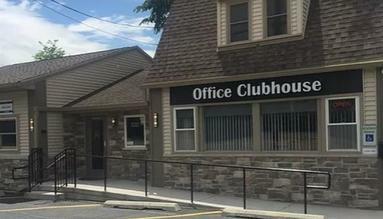 The Office Clubhouse LLC, the brainchild of Lawrence “Mac” Goodwin, is an initiative designed to provide affordable commercial space to bring customers and entrepreneurs together. This innovative concept will hopefully meet a need currently not available in the North Chicago suburbs. The Office Clubhouse makes available a physical location for business professionals, small companies, telecommuters, study groups or traveling professionals, and the like to meet in a business casual yet professional environment at budget friendly rates. Goodwin hopes to capitalize on the changing business landscape. In addition to adding a wide variety of new vendors, moving the Farmers Market to Tuesdays, resurfacing the parking lot (thanks to Santa Maria Church), the Market Committee has also added a space it calls the “Kids' Zone”. Market Manager, Gary Gunther, explains: “the kids' zone is a spot where children can participate in fun, sometime educational, activities. 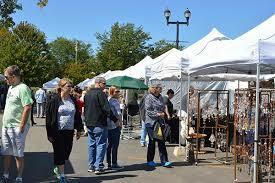 We want the market to be a leisurely, enjoyable time for shoppers and families”. Activities range from interactive/educational, like the DNR Ecology trailer, to craft-making projects. A variety of businesses, non-profit groups, entertainers, and governmental organizations are participating. A different group is featured each week.